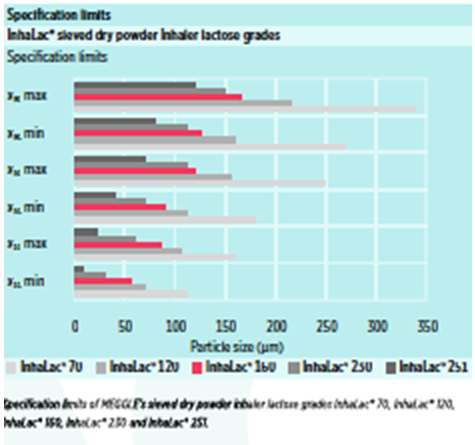 MEGGLE’s newest sieved grade of lactose monohydrate, InhaLac® 160, is ideal for pulmonary and nasal dry powder inhalation applications. 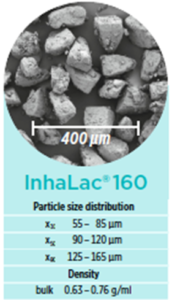 Characterized by a median particle size of approximately 110 μm, the new InhaLac® 160 fills a gap in the InhaLac® range of coarse sieved lactose grades for dry powder inhalation, sitting between the coarser lactose InhaLac® 120 and the finer lactose InhaLac® 230. Developed at MEGGLE’s Wasserburg laboratories in Germany, this inhalation grade lactose exhibits a narrowly distributed particle size with a fines content (particles below 15 μm) of 3%. Combined with high quality and safety, this material will meet individual requirements for dry powder inhalation formulations. MEGGLE’s InhaLac® alpha-lactose monohydrate grades comply with the current harmonized USP-NF, Ph.Eur., and JP monographs. 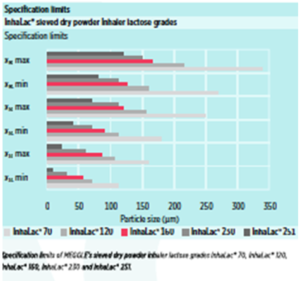 The strict microbial limits of MEGGLE`s InhaLac® formulations characterizes them as inhaler grades to meet the special requirements for dry powder inhalation. All InhaLac® products are manufactured on product lines that are exclusively dedicated to inhalative lactose. The pharma-dedicated MEGGLE production facility in Wasserburg, Germany holds an EXCiPACTTM Certificate and has implemented GMP according to the Joint IPEC-PQG Good Manufacturing Practices Guide. In addition, MEGGLE is certified according to DIN EN ISO 9001:2008 (Quality Management), DIN EN ISO 14001:2004 (Environmental Management) and DIN EN ISO 50000:2014 (Energy Management). MEGGLE invests considerably in raw material resource sustainability, production standards and efficiency and is actively engaged in environmental protection. Lactose meeting pharmaceutical standards is MEGGLE`s first priority. Specifications and regulatory documents can be downloaded from https://www.meggle-pharma.com/. Click on Technical information to see detailed specifications.